Six beehives have been installed atop a building on the university’s campus in downtown Edmonton. 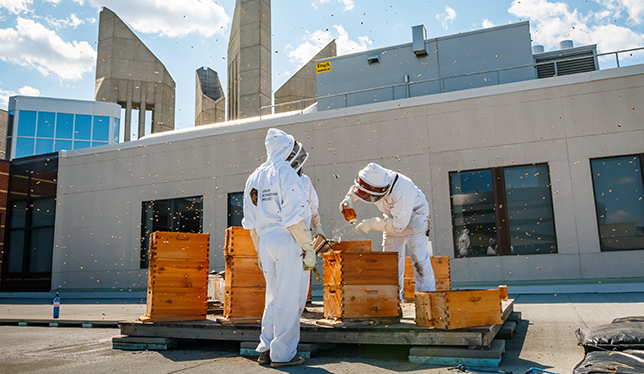 MacEwan University has itself a sweet situation: six honeybee hives have found a home on a third-floor roof at the university’s campus in downtown Edmonton. Four of the hives were installed above MacEwan’s Building 5 as part of a trial project in May 2016. Soon after, the university began bottling honey from the hives for sale on campus. That first year, the honey sold out in 23 minutes. The trial was so successful that it was recently expanded with two additional hives. “[We] sold 80 pounds of honey this year,” said Troy Donovan, MacEwan’s resident beekeeper. Troy Donovan (right) and his team tend to beehives above Building 5. MacEwan’s iconic clock tower entrance can be seen in the background. Photo by Steven Stefaniuk. Over the two years of the project, Mr. Donovan has engaged an assistant beekeeper and 12 student volunteers. He’s also worked with MacEwan’s chemistry department to take honey samples for an analysis of its phenol content, which determines how healthy the honey is. Local gardeners and apiarists are now coming to the campus to consult with Mr. Donovan and to see other urban food production projects on campus, which include a tower garden and aquaponics. Video: What does a rooftop farm do for a university?